Many US Special Operations Forces (SOF) operations happen under the cover of night. American’s elite warriors employ various electronic equipment to let them see into the shadows. These include thermal imagers and image-intensifying 4-tube night vision goggles (NVG). The latter normally comes in binocular or monocular versions. One of the major drawbacks of these types of devices is that they have a limited field of view (FOV). This creates a ‘tunnel vision’ effect; and depth-perception problems; neither of which are welcome when the military or law enforcement officials are involved in any action during the night. Night vision lenses and scopes have been a military tool since World War II, when the United States and Germany locked themselves in a night-vision arms race to see who could see farther in the dark. One result of that competition, the U.S. produced the so-called “sniperscope” a low-level infrared scope mounted on rifles that could see about 100 yards. Night vision relies on image intensification, which gathers incoming low-level light, converts those photons into an electrical signal, amplifies the signal, and then displays the boosted light-level image on a green phosphor screen, all within a split second of time. Green is the color of choice because the human eye is uncannily adept at differentiating between shades of green compared to other hues. To ensure the reliability of what is being seen, the lens must deliver clear, accurate and precise readings. At Universe Optics, you can depend on us to design and manufacture a precision lens required for night vision goggles. In recent years, Tier 1 SOF; such as Delta Force, have employed an innovative set of night vision goggles called the Ground Panoramic Night Vision Goggles or GPNVG, often referred to as 4-tube night vision goggles. Designed by L3 Warrior Systems, the GPNVG solves the limited FOV problem by integrating 4 tubes into their design. 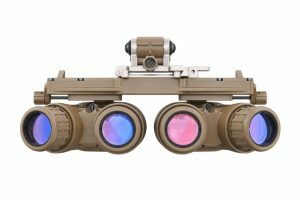 While many NVG’s use 1 or 2 intensifier tubes which provide no more than a 45-degree field of view to the wearer, the 4 tubes used by the GPNVG provide more than double that with a 97-degree panoramic view. Wearing the GPNVG, gives the operator a similar field of vision at night as they have during the day. The two central intensifier tubes operate just like regular night vision goggles, providing the conventionally overlapping, binocular-like image. The two added tubes on either side provide a similarly offset view from the outer edges of the central image. Essentially, it’s like looking through two pair of binoculars set side by side. What’s more, the additional tubes can also be popped off the frame and used as standalone monocles. One of the main adjustments for focus in a night vision goggle is the diopter. Diopter focus adjustment is traditionally achieved by rotating a diopter focus ring. This adjusts the focus of the goggle as it is in relation to the individual wearer’s eyes. This does present a challenge, as the GPNVG rear lenses are fused together; almost like a prism. This is how the operator gets the overlapping images from the forward and rear angled tubes. However, that is what keeps the goggles from being able to have diopter rings for focus. Therefore, the adjustments for the diopter are done with interchangeable diopter windows that stand off from the lens. The technology of the Ground Panoramic Night Vision Goggles is pure out-of-the-box thinking. The simple fact that they allow the operator to see more is a godsend. Since night vision goggles are designed to see at night; the more you see the better off you are.